Vintage surf style cool but is it actually any good? At a great price, this is a guitar with a unique look and some highly likeable retro sounds that will appeal to all kinds of rootsy rockers and popists. 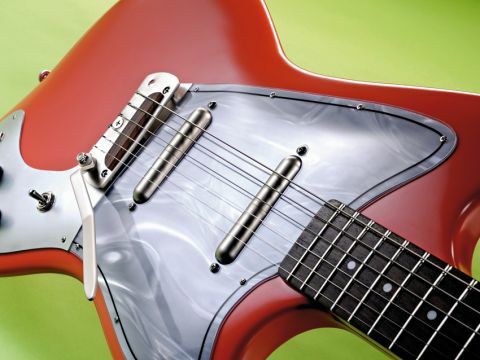 Danelectro is very much the vintage-cool, cheap-chic darling of the electric world. Whether a Fender or Gibson die-hard, the truth is there's barely a guitar player in the world who wouldn't want to own one of the company's Coke-bottle headstocked, retro-futuristic temptresses. The question is: which one? Danelectro's latest retro resurrection, the 'Dead On '67', might be just the ticket. The '67's body shape and surf-esque appointments are mostly faithful to those of the original Danelectro Dane D series and the virtually identical Coral Hornet, which was made by Danelectro but was part of the first Coral-branded solidbody Slimline series. Both guitars, according to Doug Tulloch in Neptune Bound, were introduced by Dano's owners MCA in - you guessed it - 1967 and lasted for a couple of years. Unlike the usual slab-style semi-solid ply and Masonite (hardboard) construction, here we have an evocative and curvaceous basswood body, reminiscent of a diminutive Jaguar shape but with a more shapely waist. The sculptured edge-shaping makes it appear thinner than it really is, which is approximately 44.5mm at its thickest point - pretty much the same as a Strat. But weighing in at a light 2.5kg, it balances wonderfully on a strap and its sturdy build feels more than gig-worthy. Our model arrived in Dano's vibrant orange finish and, despite looking a little bit 'salmon pink', the colour will surely add to its surf-rock appeal. The neck is maple and bolt-on with a comfortable slim 'C' profile, a rather flat 356mm (14-inch) radius and shares a PRS-like 635mm (25-inch) scale length. It feels somewhere between Gibson-slinky and Fender-familiar, making for a playing action that belies its budget appeal. The 21 medium frets are well finished, polished and seated in the pleasantly grained rosewood 'board with pearloid fret-markers and an aluminium top nut. The headstock has a squashed Strat look with adjustable truss rod, 'Totally Shielded' truss rod cover and vintage-style, six-in-a-line button head tuners. Swooping around the treble side of the body is a faux-aluminium control plate, which houses the three-way pickup selector switch and four old-school audio-style knobs. These resemble the original Dane D/ Hornet knobs and control volume and tone for front and back pickups. It's a different layout to the original Dane D/ Hornet of three rotary controls and several slide switches. The '67's vibrato is mounted to this plate and has a straightforward construction. Its flat-plate, satin aluminium bridge has machined notches to take the string ball ends and is connected to the body via two Phillips-head screws that also adjust bridge height. There's also a machine screw located at the back of the bridge that's connected to a single spring via a wing nut in the back cavity of the body. This holds the bridge plate stable and balanced. A screw on the underside of the bridge holds the rosewood saddle in place and allows overall adjustments for intonation. The stiff spring and up-angled vibrato arm has a smooth action and returns to pitch brilliantly - it's no Floyd Rose, but it really works for low-key warbles. Like all Danelectro models, the Dead On '67 has two distinct looking single-coil lipstick tube pickups that, as with some original models, are housed in two separate lipstick cases. These are mounted onto a mother-of-shower curtain pickguard, which has a plastic see-through cover on top of it. Despite its wholly solid body construction, the lipstick tube pickups manage to coax the same squeaky clean and vintage dirt sounds found in its chambered counterparts. Set clean, the bridge position has a fulfilling and brassy resonance; not so much woody, but gritty and airy. With a bit of gain and lashings of springy reverb from our test Orange Thunderverb 50 added, the '67 serves up sweet and atmospheric tones with a bell-like top-end and plummy mid-range, delivering atmospheric sonics much in the vein of Explosions In The Sky or The Appleseed Cast. Using a similar amount of drive from the amp, both middle and neck positions induced almost addictive trashy garage-rock tones, pitching you in The Black Keys territory with a bit of fuzz or, set slightly cleaner, Jack White's characterful-sounding Sixties rock. Nothing sounds quite like a Danelectro, and the Dead On '67 offers you a tasty slice of that twangin' goodness at a rather humble £289. The '67 offers all the retro-chic looks you could want and unique Sixties sound that, from time to time, any guitar player should indulge in.